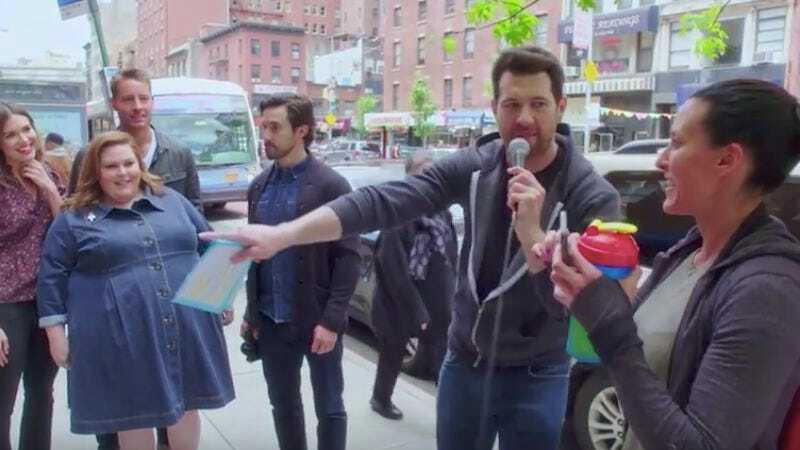 It’s been a while since we’ve seen Billy Eichner running around New York with celebrities in tow, but he’s returned with the cast of This Is Us trailing him. NBC would have you believe the series is the biggest phenomenon in the world—one that inevitably and immediately provokes tears—so Eichner tests what effect Justin Hartley, Chrissy Metz, Mandy Moore, and Milo Ventimiglia have on passers by. Spoiler alert: Most are relatively unfazed. One guy even watches the show, but couldn’t really care less about the fact that he’s now standing in front of the cast. “I’m from New York and I meet lots of amazing people in the street,” he says. Moore’s presence also means Eichner pitches his idea for shows starring musicians, gearing up for a legal drama with India Arie and a detective show with Michelle Branch.